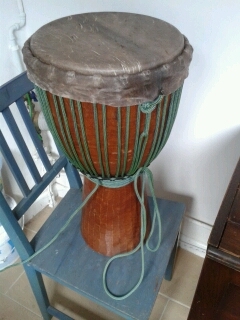 If you‘re djembe has a broken skin Joliba are here to offer you a first class repair, using new skins from The Gambia you’re djembe will be re skinned to your desire, alternatively you can trade in your old djembe for a brand new one. Djembes are reskinned by David and probably one of the finest drum makers in the UK at the moment, Maitre Samsou. Prices start at around £75. If you would like any repairs please Contact David on 01782747879 to discuss and get a quote. 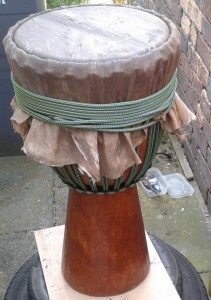 Ivory-Coast, hardwood djembe, stage two finished with new skin, new rope and tension applied.